Search Results for "change room"
Close-up view of woman comes out from the apartment and changes the knob on door hanger, asking to clean the room. 1930s: Men in bathing suits leave change room. People in summer wear walk to beach. Lifeguard chair w/ Temp 76 degrees. Regulations prohibit refuse, ball playing, dogs, picnic baskets, and disrobing. Hands of female technician during microbiology and bacteriology analysis, dolly close up shot through the glassware, shallow depth of field, focus change, room interior. Girl Looks at Self in Swimming Costume at Swimming Pool as she Talks with Girl in Changing Room. 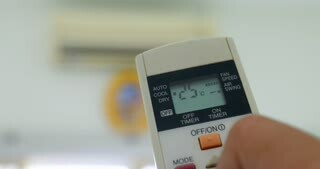 Heating room by changing temperature on air conditioner remote control. Air condition wireless remote control in hands for room temperature adjust. UNITED STATES: 1940s: Sign on wall for perception demonstration centre. Two men poke heads behind two picture frames. Man and boy change places in perception room. Hand close up of elderly patient who lying on table under anesthesia, surgery procedure in operation room, focus change on surgeons hands in protective gloves using surgical tools to operating man.